Jane Goodall, the iconic primatologist and U.N. Messenger of Peace, is equally committed to the welfare of companion animals. Her favourite animals, in fact - are actually dogs. 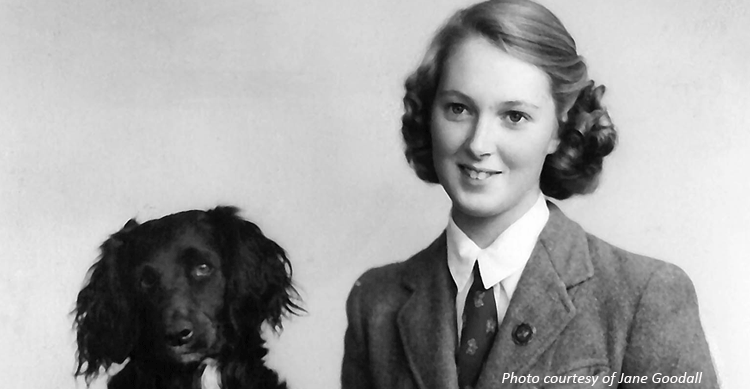 Jane maintains that her childhood companion, a dog called Rusty, was one of her greatest teachers. "He proved to me that animals have minds, personalities and feelings. This gave me great strength in my convictions and work with chimpanzees". In July 1960, at the age of 26, Jane Goodall traveled from England to what is now Tanzania and bravely entered the little-known world of wild chimpanzees. She was equipped with nothing more than a notebook and a pair of binoculars. But with her unyielding patience and characteristic optimism, she won the trust of these initially shy creatures, and she managed to open a window into their sometimes strange and often familiar-seeming lives. Hear Dr Goodall’s perspectives on current environmental issues, what the future looks like for the inhabitants of our shared planet and what we can do to to rewind the future. This event will consist of a 40-minute lecture by Dr Jane Goodall, followed by a 40-minute conversation between Dr Jane Goodall and the event host. Jane continues her work today by travelling an average 300 days per year speaking in packed auditoriums and school gymnasiums about the threats facing chimpanzees, other environmental crises, and her reasons for hope that we will ultimately solve the problems that we have imposed on the earth. Jane urges her audiences to recognize their personal power and responsibility to effect positive change through consumer action, lifestyle change and activism. Roots & Shoots, which Jane started with a group of Tanzania students in 1991, is the Institute’s global environmental and humanitarian youth program for young people from preschool through university with nearly 150,000 members in more than 130 countries. "This is me with Astro, lurcher, family dog. It is a big sadness in my life - I cannot have my own dog any longer because I travel so much. Fortunately at our family home there are always dogs, and one always bonds with me"
Jane Goodall's favourite animals are actually dogs!